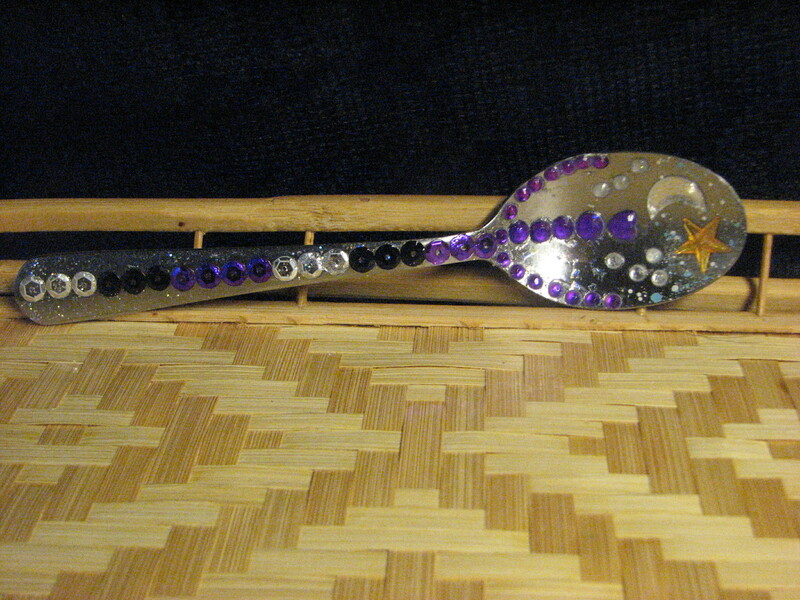 Inspired by “The Spoon Theory” written by Christine Miserandino where you can read the entire story at this link http://www.butyoudontlooksick.com/articles/written-by-christine/the-spoon-theory/ I have decided to make Collector Bling Spoons to sell in my Etsy store. 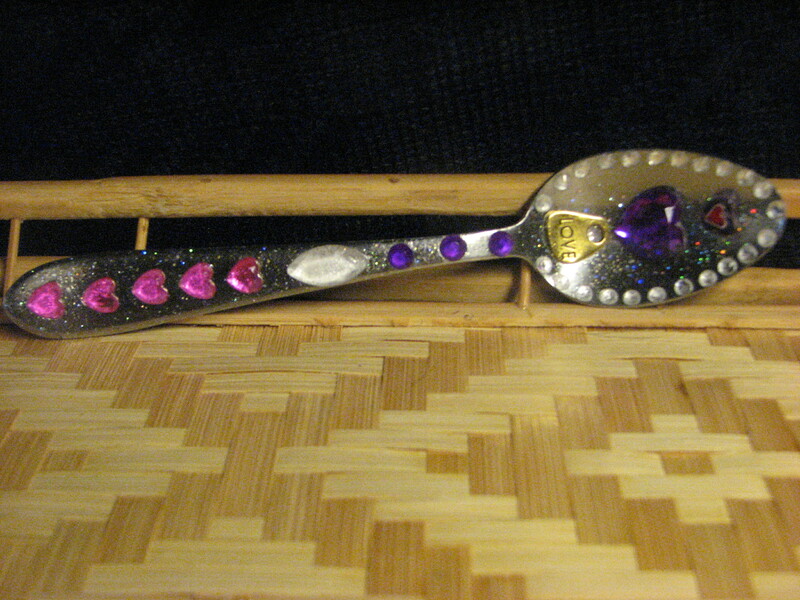 Being a t-shirt holder to a couple of invisible illnesses and being married to a man who is prematurely disabled, we both run out of spoons every day! What I would give for a number of extras. 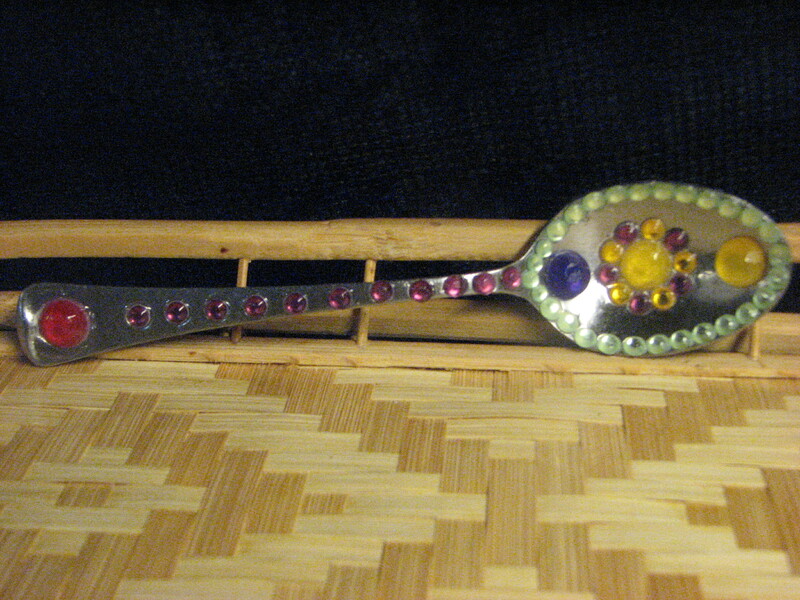 Of course that isn’t likely, but, I would love to give a pretty one as a token and gift, to my many friends who are also survivors of many invisible illnesses and need spoons. Something to cheer them up and to remind them there are many who share their plight. 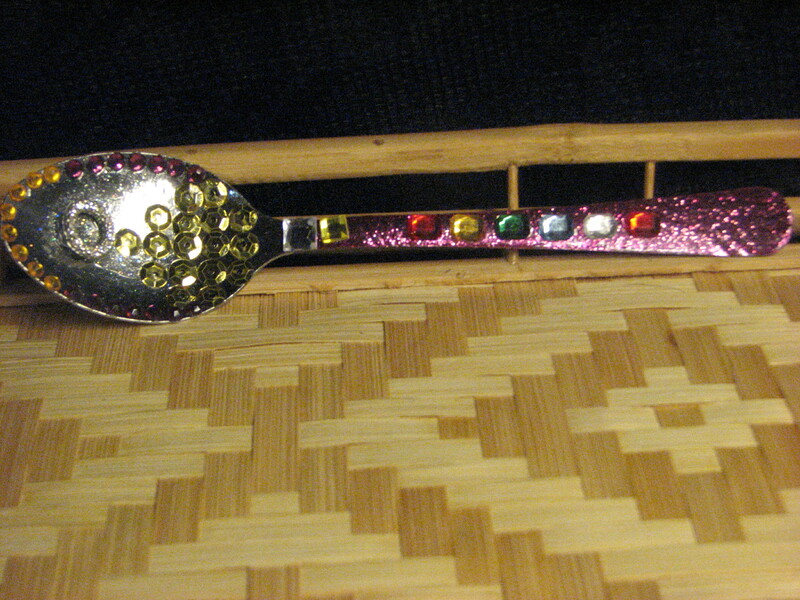 So many months ago I went to the used store and started looking for large serving spoons and bling. It took me a long time to get the energy to actually start making them, and I have no idea if anyone will even buy one, but, I am making them and selling them. Each one is different so I am calling them collectors. Some are labor intensive and take a few hours to make and some are much quicker but all come from my heart, thinking of all of us struggling with our various foibles and struggles. I would love to hear from you if you think this is a good idea or not and if you think they will sell and what price you think they should be? I inserted a few pictures, which were very difficult for me because the silver glare is a bugger to get around and get a good picture of the actual piece! I am not a photographer! This entry was posted in arthritis, Chronic Pain, conditions and diseases, depression, dying, Fibro, Fibro Warriors, Fibromyalgia, grief, Herbal Medicine, herbal remedies, Hypothyroidism, life, Medicine, Musculoskeletal Disorders, Natural Foods, pain, Self Help, Spoon Theory, Survivors, Symptom, thyroid, wrong diagnosis and tagged ALzheimers, arthritis, cancer, chronic illness, Chronic Pain, chronis pain, Fibro Warriors, Fibromyalgia, Hypothyroidism, Invisible Illnessess. Bookmark the permalink. 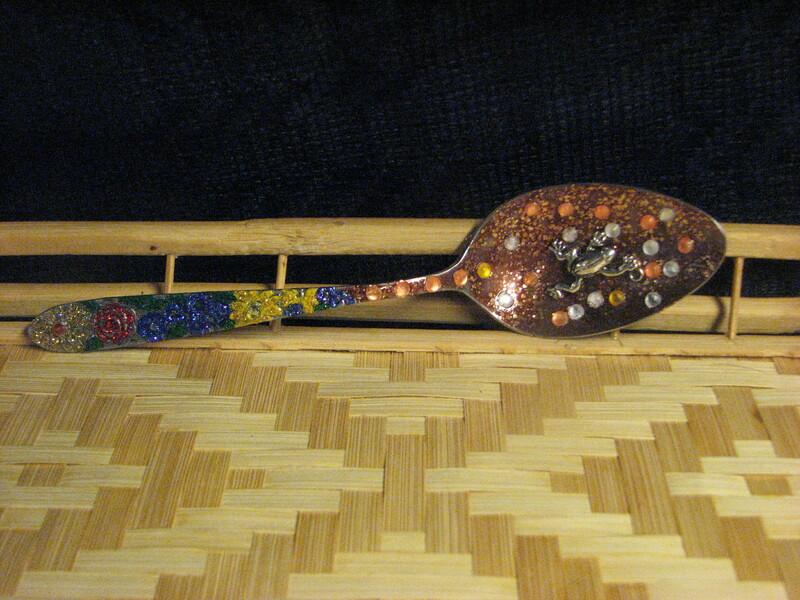 Better get these lovely spoons up on your etsy site stat! I reposted without reading the fine print and have already gotten a few likes on them, so people may be clicking through to etsy already and not finding them there. If you can’t get them up right away just let me know and I’ll unpost them and the repost when you’re ready. Love them and can’t wait for you to get a whole bunch of orders!